Our solid wood table collection provides a timeless anchor for the interior design schemes of offices, restaurants, hospitals, hotels, retirement villages and sports clubs – as well as private homes. Ranging from hotel desks and bedside tables to traditional dining tables and coffee tables, all our table frames are made from solid ash timber which is sourced from sustainable forests in North America and is extremely strong. Table tops are made from chipboard with solid wood edging and a wood veneer top and bottom. All tables are finished with a strong lacquer so that the table frame and veneer top are extremely durable and suited to high traffic settings. 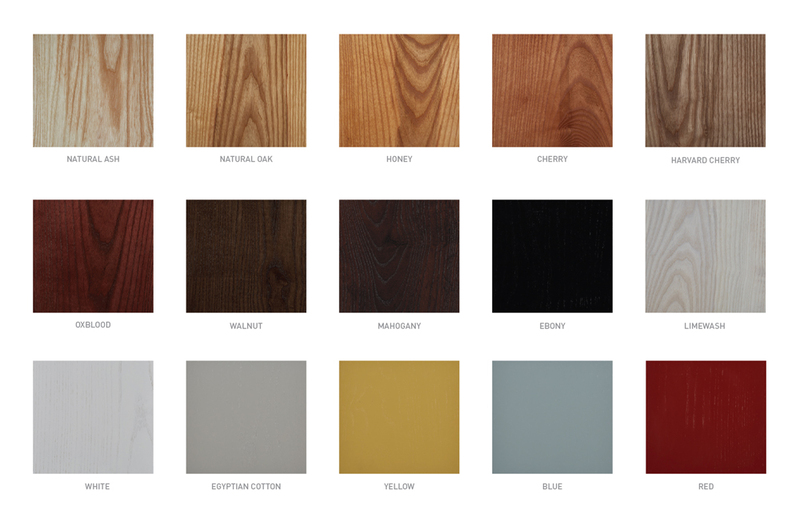 Choose your table in one of our 15 timber finishes, ranging from natural ash, oak and mahogany colours through to reds, whites, blues and limewash. Although we manufacture complete tables, we also supply tops and pedestal bases separately – so you can pair your own marble top with our wooden bases, or add metal legs to a wooden top for a more modern, industrial look.